Another crazy food ‘holiday’, another delicious blog post. Let’s make the most of National Grilled Cheese Day with delicious wine pairings. 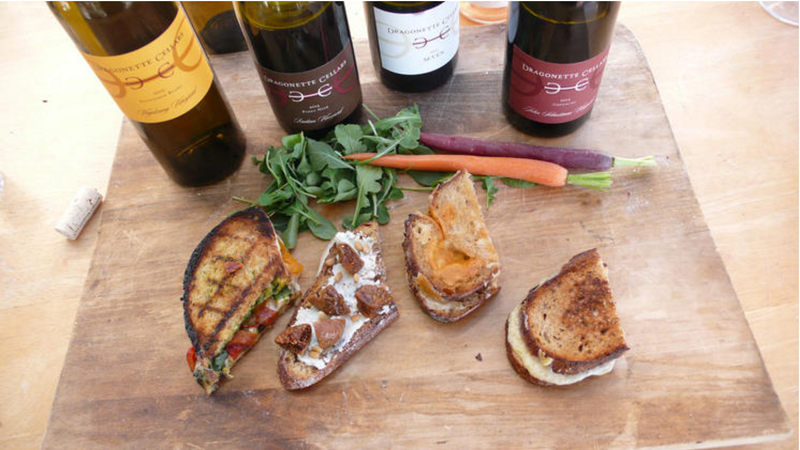 In 2015, Dragonette Cellars winemaker Brand Sparks-Gilles, who has also worked as a baker, sat down with the LA Times to write this article, Wines that work with grilled cheese. Today, we’re breaking down the article and the recipes so you can have the happiest National Grilled Cheese Day ever. It’s on Tuesday, April 12th, by the way. Rest assured that Brandon used the highest quality bread (some, sent to him from CO., some purchased at his favorite local bakery) and the best cheese he could find. Try taking your grilled cheeses up a notch by sourcing the highest quality, freshest, ingredients possible. These wines pair with more than grilled cheese. For a full list of recommendations from the LA Times team, check out their follow up post HERE. Want more delicious wine pairings delivered to your inbox weekly? Subscribe in the upper right-hand corner. Cheers!